The model is Lucy, who claimed it as her own long before it was finished. I chose the Teal Dreams colorway in part because of the non-canine recipient's preference for blue, and in part because solid colors make for boring knitting. Seriously. Boring. Note that the pattern calls for a solid brown. The brown is a nice color and all, but I'm a knitting rebel and rarely ever use the same colors called for in a pattern. So, multi blue seemed the obvious choice; despite the colorway name, it really is way more blue than teal. Lucy gives it two paws up. In addition to my color requirements, I also wanted a yarn that would knit up quickly, and that would be fuzzy and soft. Bernat Blanket fit the bill on all counts. Normally, I despise working with chenille. We still tell tales of the green chenille teddy bear I crocheted for my best friend. There was green fuzz everywhere for months while I worked on the thing. Thus, my experience with chenille is not one of fond memories in the making, but of constantly cleaning fuzz off myself, the floor, the furniture, and innocent bypassers caught in the fuzzy green cloud, the likes of which is surely banned by the Geneva Convention. 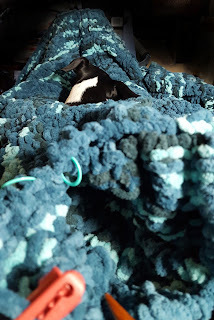 As one might imagine, I started the blue afghan project with much trepidation, expecting once again to produce an unbreathable, inescapable cloud of fuzz, this time in a blue camo-ish pattern of airborne suffocation. I was, however, pleasantly surprised to find that Bernat Blanket was not only easy to work with, it also held together very well. In fact, there was almost no loose fuzz at all. Whatever magic Bernat used to hold this yarn together was the right choice. Innocent bystanders everywhere can rejoice and breathe easy in the presence of this yarn, even in the absence of a lint remover. I'm actually tempted to make myself a green one. That is, once the teddy bear flashbacks stop.